HealthCare.gov website is seen on a computer screen in New York, Oct. 23, 2018. The sign-up period for next year's individual health insurance coverage runs from Nov. 1 to Dec. 15. Picking a plan can initially involve several trips to websites like healthcare.gov just to understand the options. Shoppers who want to stick with the same plan must scrutinize it for changes. On Thursday, the Affordable Care Act health-insurance exchanges opened for the sixth year. A well-kept secret about them is hiding in plain sight: Despite the Trump administration’s best sabotage efforts, the exchanges are succeeding. Indeed, by almost every metric, the exchanges are now stable and even thriving. Just days before an election in which health care is a top issue, this important point has been almost totally ignored. First, enrollment is strong. During last year’s enrollment period, nearly 12 million Americans bought insurance on the exchanges, and more than 25 percent of them were first-time customers. This amounted to a 3 percent enrollment drop-off from the previous year, but considering the Trump administration’s concerted effort to disrupt enrollment, the slight dip demonstrates that the design of the exchanges is fundamentally sound. 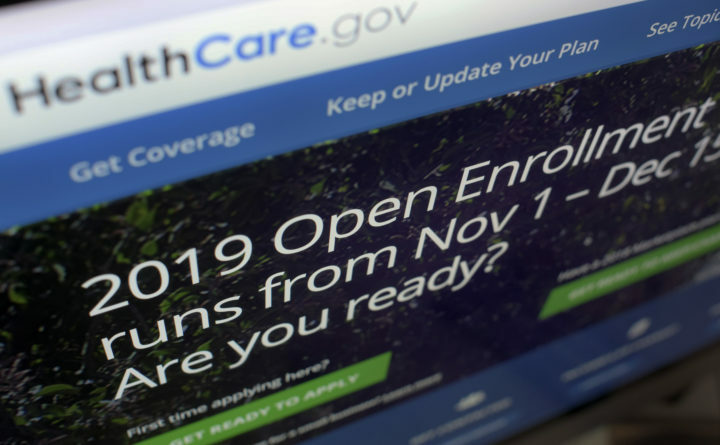 In 2017, the Trump administration cut the open-enrollment period by more than half, made Healthcare.gov unavailable most Sunday mornings, slashed funding for advertising by 90 percent and cut funding for enrollment navigators by 40 percent. Republicans also canceled cost-sharing subsidies for insurers the month before open enrollment and repealed the individual mandate to sow confusion and chaos in the exchanges. Despite all these vigorous efforts to send the exchanges into a death spiral, Americans voted with their feet and bought insurance. Clearly, the only thing holding the exchanges back is the federal government’s level of support. In some states that managed their own exchanges, such as California, exchange enrollment increased. That is good news. Second, premiums are lower. For Americans shopping on the exchanges, many are getting a great deal. Across the market, premiums are down in 2019. Yes, you read that right: down. A few weeks ago, the Centers for Medicare and Medicaid Services (CMS) announced that average premiums for the benchmark silver plan are down 1.5 percent. As supporters of the ACA have consistently argued, the 2017 premium spikes were a one-time adjustment. After a few rocky years, insurers are figuring out how to price the market, and premiums are leveling out. For example, Blue Cross Blue Shield of North Carolina recently announced that it was able to cut premiums for coverage offered in the individual market, including the health-insurance exchange, by 4.1 percent. This is the first rate decline in the North Carolina individual market ever, and it might have been larger had federal and state policy not worked at cross-purposes. And North Carolina is not alone. According to CMS, of the 39 states on Healthcare.gov, five had double-digit declines, led by Tennessee with a drop of more than 25 percent. Other populous states, including Pennsylvania and New Jersey, had declines exceeding 14 percent. Only three states had double-digit increases, and all the states were small: Hawaii, North Dakota and Delaware. More important, the subsidized premiums across all states rose a mere 2 percent. This increase was lower than for private, employer-sponsored insurance, where premiums rose by an average of 5 percent for families and 3 percent for individuals. These declines in premiums reflect the broader success of the ACA in controlling health care costs. For eight years since the ACA passed, health care costs have moderated, growing much less than during the George W. Bush administration. Indeed, per-person costs in Medicare and Medicaid have declined, and per-person costs in private insurance have increased on average less than 4 percent annually since 2010. Finally, in 2019, many health-insurance companies are joining or expanding their presence on the ACA exchanges. CMS recently released a report showing that after declines in the number of insurers, 2019 will see 23 new insurance plans in the exchanges and an additional 29 plans that are expanding their geographies into new counties. Indeed, for 2019, the percentage of counties with only one insurer has dropped significantly, from 56 percent to 39 percent — all despite the individual-mandate repeal. That is pretty amazing, and it represents a vote of confidence by the insurance companies in the viability of the exchanges. Most important, for Americans worried about protections for pre-existing conditions, the health of the exchanges is good news. All Americans, even those who don’t use the exchanges today, can rest assured that they have a good option for affordable insurance regardless of their health or job status. There is a robust health-insurance safety net. Eight years after passage of the ACA, there remain serious problems in health care needing attention: exorbitant drug prices, high out-of-pocket costs and super-high deductibles. But the expansion of coverage through the health-insurance exchanges is one of the most important pieces of the ACA’s legacy that is too often neglected or outright denied. Despite constant maligning, the exchanges are succeeding. Ezekiel Emanuel is chair of the Department of Medical Ethics and Health Policy at the University of Pennsylvania and senior fellow at the Center for American Progress. He served in President Obama’s White House from 2009 to 2011.